The New Year starts off with a bad conscience. A bar he hardly knew had booked Neoangin for a show on New Year’s Eve. The flyers had been printed prior to Jim confirming the gig, and the closer the date the less he felt like playing. It was in the early evening of the 31st and Jim was having some drinks with friends. One thing led to another and Jim made himself believe he was feeling faint. He cancelled the show with the feeblest of voices and the club was left without a band at midnight. Jim didn’t come off unscathed—a tummy ache haunted him over the next few weeks. Neoangin spends the first few months of the year composing introverted sound clips for a Korsakov project. The theme is “life in a shopping mall”. It is already the end of March when Neoangin’s touring life awakens from its hibernation. 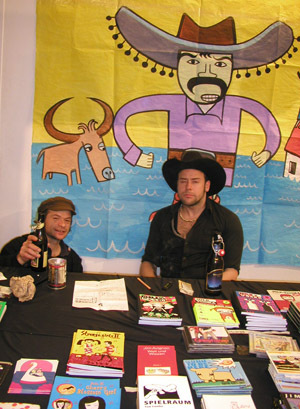 Together with the Swiss artist collective Milk & Vodka Jim organizes a salon with the Friendly Capitalism Lounge at the Fumetto Festival in Switzerland. Each day for 10 days a musician/band and a cartoonist/illustrator concoct an event. The Swiss man François Chalet accompanies Neoangin’s concert with a brilliant live-animated video show. The Goethe-Institute in New York commissions a Blinddate Party on a whim: complete with flyers, artists and decoration by yours truly, who goes out and books Theremin player Dorit Chrysler, Felix Kubin and PotiPoti. Neoangin comes up with the following idea as a mini-happening: each visitor has to go through an immigration ceremony upon entering the event. In exchange (s)he receives the welcome gift of a Euro, which can be used to purchase a welcome drink. The blue cocktails were something: audience and artists took weeks to recover from the ensuing hangover. Nonetheless everyone has fond memories of this marvelous evening. The Goethe Institute liked the event so much that they booked another party for the coming Fall—this time a tad bigger though: location Guggenheim Museum, New York. Jim didn’t lose any time and booked The Notwist for this grand event. But come fall the Goethe people in charge were replaced by new folks, who had never heard of the band The Notwist. Ruefully they cancel the evening. In June Neoangin plays at Berlin’s HAU along with the Chinese punk band Joyside. He goes beyond his own standards: we are talking Mao doubles, a dragon, he even sings a duet with Cora Frost and still the punkrock audience wouldn’t really warm up to him. The purchase of a bulbous Ukulele undoes a songwriting block and within no time Neoangin composes breezy tunes about contemporary folks—almost in the tradition of the early Kinks. A new album is in the air. This time Neoangin does almost entirely without presets. He even records the drum and bass manually on his midi piano. Some songs take forever to grow, others come by with virtual ease. I know you from is born during a walk across the Williamsburg Bridge. The Starving Artist came about on an airplane. By the end of September the album is ready to go and the usual suspects gather for the recording at Villa Kurella. One evening a rain-soaked Nova Huta shows up with 3 pizza cartons and within 2 hours he manages to immortalize himself musically on 4 tracks. Back in New York Neoangin is invited very short notice to play at the infamous Mercury Lounge on the Lower East Side. 10 minutes before the beginning of the gig the sound guy starts complaining that the stage set was not fire resistant. 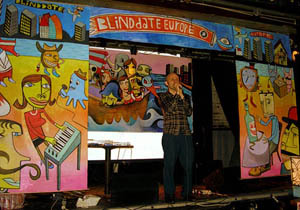 Jim has to take down his paintings, but he grabs some folks from the audience to hold up the paintings on stage. For a long time there have been plans to reactive the inoperative website by means of a new design. Webmaster Moritz has already been programming for quite some time but he and Jim just cannot come to terms on certain details. But in light of the release of the new album they pull themselves together and finish the website in an all-nighter. In Berlin Neoangin manages to convince a camera team to chauffeur him around town all day—in return for a filmed segment. While Jim cannot find the gallery Kurt im Hirsch in front of the filming crew he finally finds the right words regarding his move to New York. Due to space issues Neoangin performs his show at this gallery on top of an old tiled stove. At the No Logic Festival in Barcelona the police shows up early in the evening due to noise complaints. In order not to cancel the show Neoangin performs in whisper mode. He encourages the audience to wave their arms instead of clapping. Jim deftly and tactfully extends an invitation by the Goethe Institute in Athens so that 15 other artists are flown to Greece. This way the entire Friendly Capitalism Team meets up in Athens. 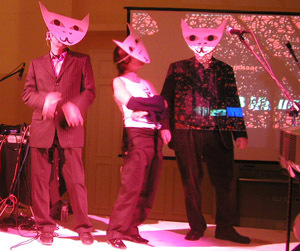 As a thank you Jim asks director Pöhlmann of the Goethe Institute in Athens, who donned a mask for the occasion, to come up on stage.